Video clip synopsis – Well-paid but back-breaking sugarcane work in North Queensland provided the initial resources for Giovanni's business. He and his family went on to create a now highly- successful imported tile business. Broadband MP4 migrantwork_bb.mp4 (3.8MB), suitable for iPods and computer downloads. 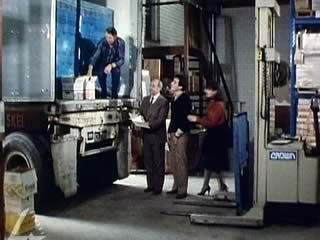 Giovanni’s Tile Business Grows is an excerpt from the film Working (55 mins), an episode of the series The Migrant Experience (6 × 55 mins), produced in 1984. Working: Work is one of the most significant points of interaction between migrants and the wider community. This program examines the experiences, both good and bad, of the migrant workforce in Australia over the years, with a particular emphasis on the post-war era when migration and the economy were booming. The Migrant Experience: Drawing upon a rich variety of techniques – dramatised re-enactment, actuality, cinema verite, archival footage and others – the producers have been careful not to subjugate fact to entertaining fictions about our past, yet The Migrant Experience is richly entertaining. It is also controversial. It hotly debates the White Australia policy in the very first episode, which offers a general history of migration to Australia over 200 years. In Part Two we are given the reasons why so many people left their homelands and chose Australia as their future. How they were received (not always kindly) is the subject of Part Three. Parts Four to Six focus on the work of migrants, how their resettlement affected them and their children and the impact they had, in turn, on the Australia they now call home. The Migrant Experience was produced by Film Australia and the Australian Institute of Multicultural Affairs. H10 communicates information, ideas and issues using appropriate written, oral and graphic forms. This influx of migrants was almost a social revolution in Australia, as most previous mass migration had been focused on British people. This migration would have a major impact on the migrants’ lives, but also on Australia. The existing Australian population for the most part accepted these foreign newcomers, these 'new Australians’. Australian cultural life changed dramatically over time. Assimilation policies of the time demanded that migrants leave their ethnic ways behind and become 'Australians’. These new Australians, like Giovanni Spada, rose to the challenge of starting life again in a new land. Giovanni and his wife raised their family here. Their children are first generation Australian Europeans with mixed cultural values. Considering the Society and Culture key concepts of work, leisure, identity and values, examine the film clip and Giovanni Spade’s story. In what ways has ‘work’ been important in Giovanni’s life? If you were considering the concept of work ethic as it relates to Giovanni Spade – how would you describe his attitude to work? According to Giovanni his family share work and leisure time. To what extent do you believe each of these to be important to Giovanni? Destination Australia – The Migrant Experience Since 1788, Film Australia, 1984.